We’d love your help. Let us know what’s wrong with this preview of Foul Play on Words by Becky Clark. To ask other readers questions about Foul Play on Words, please sign up. A cozy mystery that provided enough humor to make me laugh at Charlee's inept investigative skills. The book started out with Charlee waiting at the airport for her friend Viv to pick her up. Viv was rather late when she finally arrived and burst out that her daughter, Hanna, had been kidnapped. Charlee takes over preparation for a writer's conference she's attending to allow Viv to search for Hanna. It seems like everything than could go wrong with preparing for the conference did go wrong. The A cozy mystery that provided enough humor to make me laugh at Charlee's inept investigative skills. The book started out with Charlee waiting at the airport for her friend Viv to pick her up. Viv was rather late when she finally arrived and burst out that her daughter, Hanna, had been kidnapped. Charlee takes over preparation for a writer's conference she's attending to allow Viv to search for Hanna. It seems like everything than could go wrong with preparing for the conference did go wrong. The chef quit, the hotel double-booked the conference with a dog show, the conference volunteers got food poisoning and could not help out. What a mess! Charlee Russo heads to a writer's conference to be a speaker. When she arrives, she finds out her friend Viv's daughter has been kidnapped. Since Viv is organizing the conference, Charlee steps in to help so Viv can search for her daughter. It ends up being more than Charlee bargained for, including a double booked hotel and food poisoned volunteers. The second book in the Mystery Writer's mystery series by Becky Clark. I recommend picking up the first book, Fiction Can Be Murder, before reading Charlee Russo heads to a writer's conference to be a speaker. When she arrives, she finds out her friend Viv's daughter has been kidnapped. Since Viv is organizing the conference, Charlee steps in to help so Viv can search for her daughter. It ends up being more than Charlee bargained for, including a double booked hotel and food poisoned volunteers. The second book in the Mystery Writer's mystery series by Becky Clark. I recommend picking up the first book, Fiction Can Be Murder, before reading this one. Personally, I enjoyed the first one more, but the second book is a good addition to the series. In this book, Charlee is dealing with the chaos around the writer's conference. Of course, Charlee also wants to investigate the mystery of her friend's missing daughter. There is a lot going on in this book. Too much. FOUL PLAY ON WORDS by Becky Clark is the second in her ‘Mystery Writer’s Mystery’ series, the first book being ‘Fiction Can Be Murder.’ Any avid cozy reader would be attracted by the premise of a mystery where the setting is a writer’s conference. Mystery author Charlee Russo agrees to speak at the Portland writers' conference that has been organised by her friend, Viv. When Viv picks her up at the airport, she frantically tells Charlee that her daughter, Hanna, has been kidnapped. Charlee takes o FOUL PLAY ON WORDS by Becky Clark is the second in her ‘Mystery Writer’s Mystery’ series, the first book being ‘Fiction Can Be Murder.’ Any avid cozy reader would be attracted by the premise of a mystery where the setting is a writer’s conference. Charlee takes over the conference preparation so Viv can search for her daughter, but the situation gets tense when the hotel double-books the event with a dog show. Despite this, Charlee is compelled to investigate after she learns shocking secrets about both Hanna and Viv. Will she find Hanna in time, or will a plot twist lead her to an awful ending? For me, this exciting and thoroughly entertaining mystery has a solid plot, supported by some charming and engaging characters. There was plenty of humour in FOUL PLAY ON WORDS and the mystery was packed with some fantastic one-liners. If you are grabbed by a winsome mystery then this may well be a perfect novel to try. This was absolutely awesome and so funny in places! I just love the author's sense of humor which transfers easily to her characters. I don't think Viv, Charlee's good friend, was mentioned in the first book, at least I don't remember her, but she and the conference were the center of this book. The first one took place in Charlee's home state of Colorado, and we met her writers' group. The writers' conference was being held in Portland, Oregon, and suddenly Charlee found herself in charge, turn This was absolutely awesome and so funny in places! I just love the author's sense of humor which transfers easily to her characters. I don't think Viv, Charlee's good friend, was mentioned in the first book, at least I don't remember her, but she and the conference were the center of this book. The first one took place in Charlee's home state of Colorado, and we met her writers' group. The writers' conference was being held in Portland, Oregon, and suddenly Charlee found herself in charge, turning more than the kidnapping into a mystery, suspecting everyone of different things. It was pretty comical when she was following different people around and calling the police to report a kidnapping that she had no evidence of ever happening, since Viv swore her to secrecy. Charlee, a mystery writer, is forced to run a writer’s conference when her best friend, Liv, tells her she has to look for her daughter Hanna, who has been kidnapped. The conference is rather a mess what with double booking the conference rooms with a dog agility show and the recent firing of the chef that was providing the food. In addition, all the experienced volunteers are home s Foul Play on Words is a cozy mystery set at a writer’s conference with dogs and a possible kidnapping on the side. Thanks to the publisher, via Netgalley, for an advance e-galley for honest review. Charlee Russo is a mystery author who has once again found herself at the center of a real-life mystery, helping her friend find her missing daughter while also taking on her friend's responsibilities at the writing conference Charlee's been invited to speak at. Charlee is an entertaining, irreverent protagonist- she's trying to be helpful though often finds herself annoyed with the disorganization of the conferen Thanks to the publisher, via Netgalley, for an advance e-galley for honest review. When mystery author Charlee goes to Portland for a writer's conference, she gets involved in a whole lot more than she signed up for: a kidnapping, a dog agility competition, an admirer with a very famous name, and she gets roped into running the conference that seems cursed. This is a well-paced story with no shortage of suspects and suspicious events. I missed a couple of the characters from the first book, but this one has a nice variety of interesting characters to meet. I was pretty shocked When mystery author Charlee goes to Portland for a writer's conference, she gets involved in a whole lot more than she signed up for: a kidnapping, a dog agility competition, an admirer with a very famous name, and she gets roped into running the conference that seems cursed. This is a well-paced story with no shortage of suspects and suspicious events. I missed a couple of the characters from the first book, but this one has a nice variety of interesting characters to meet. I was pretty shocked by the reveal of the culprit(s), and you may be, too. Though it took me a couple chapters to really get drawn into the story, the second Mystery Writer's Mystery didn't disappoint! This can easily be read as a standalone, but if you read this book first and enjoy it, you'll want to read Fiction Can Be Murder. I haven't bonded with Charlee yet but she has potential. Charlee's BFF Viv always gets Charlee to help at her annual writers' conference - this year as the keynote speaker. When Viv's daughter is kidnapped, Charlee finds herself in charge of setting up and running the conference in a hotel that has double booked themselves. Sharing a hotel and conference center with an agility dog contest provides some much needed distractions and interesting exploits. I am looking forward to book 3. Foul Play on Words by Becky Clark started with some funny one-liners, but then it began to try too hard to continue to be funny, and it came off as a bit juvenile. The dialogue lacked believability and depth. Charlee, the main character, comes across as brash in her dealings with people she encounters at the hotel and writer’s conference. Unfortunately, most of the characters were one dimensional, the plot and mystery outcome rather comical (and not in a good way). The only redeeming qualities w Foul Play on Words by Becky Clark started with some funny one-liners, but then it began to try too hard to continue to be funny, and it came off as a bit juvenile. The dialogue lacked believability and depth. Charlee, the main character, comes across as brash in her dealings with people she encounters at the hotel and writer’s conference. Foul Play on Words by Becky Clark was an entertaining mystery with a strong plot that is supported by strong characters. This was a funny mystery, filled with great one liners. There where spots where I did not always follow Charlee's logic or reasoning. If you love delightful mysteries try giving this one a whirl. Mystery author Charlee Russo agrees to speak at a Portland writers' conference organized by her friend Viv Lundquist. When Viv picks her up at the airport, she frantically tells Charlee that her daughter Hanna has been kidnapped. Charlee takes over the conference preparation so Viv can search for her daughter, but the situation gets tense when the hotel double-books the event with a dog show. Despite this, Charlee is compelled to investigate after she learns shocking secrets about both Hanna and Mystery author Charlee Russo agrees to speak at a Portland writers' conference organized by her friend Viv Lundquist. When Viv picks her up at the airport, she frantically tells Charlee that her daughter Hanna has been kidnapped. 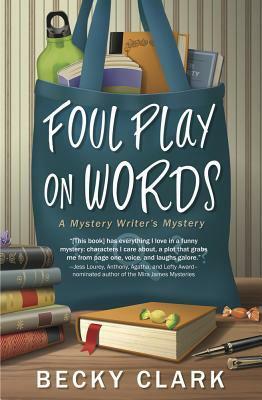 From Midnight Ink comes Becky Clark's second book in the “A Mystery Writer’s Mystery” series, Foul Play on Words. This is a fun, humorous story detailing the adventures of a mystery writer who keeps getting involved in criminal investigations. Charlee isn’t the average mystery writer, she has a wacky sense of humor, is a bit paranoid and quite often her imagination gets carried away. She is likable yet comes off as slightly dim and not overly creative. Charlee doesn’t trust easily; past experiences have made her somewhat suspicious of everyone’s motives. There are times when she should be cautious but isn’t. Other characters in this story do not play a big enough role to know what they are like. There is little to no description of who they are or what their past relationship with Charlee entails. Other than Viv, who doesn’t appear to be a very good friend or a trustful one. Although there is mention of Charlee’s BF he only makes an appearance during telephone calls, and the reader learns nothing about who he is or his and Charlee’s story. The villain was immediately recognizable. Although the motive is made plain it comes off as petty and childish. Many readers will enjoy the subtle clues and the final unveiling, with a happy ending. The dog show that is going on at the same time as the writer’s conference adds humor to an otherwise normal setting. Happily, no dogs were injured in this story and one special pup helps save the day. I would like to have more depth to the characters and a lot more information on Charlee’s background. As this is only the second book in a series, characters are still being developed. It is hoped that in the next book, Charlee becomes more substantial with her BF and other characters playing bigger roles. The setting could have been great but was not an intricate part of the plot. Foul Play on Words by Becky Clark is the 2nd book in a Mystery Writer's Mystery series, and it was a fun . Charlee Russo is a mystery writer, who has agree to speak at a Portland writers' conference to help her friend Viv. When Viv is late picking her up at the airport, that should have been her first clue of things to come. Viv says her daughter has been kidnapped, and she wants Charlee to take over for her at the conference. Not only is this book laugh out loud funny, it has a great mystery al Foul Play on Words by Becky Clark is the 2nd book in a Mystery Writer's Mystery series, and it was a fun . Charlee Russo is a mystery writer, who has agree to speak at a Portland writers' conference to help her friend Viv. When Viv is late picking her up at the airport, that should have been her first clue of things to come. Viv says her daughter has been kidnapped, and she wants Charlee to take over for her at the conference. Not only is this book laugh out loud funny, it has a great mystery also. I found this book to be a quick read, with a well developed plot and characters. If you love funny cozy mysteries, I recommend this book. I am anxiously waiting for the next book in the series. Good story, even though the MC did some stupid stuff, there were a lot of fun parts to it. Interesting story, kind of complicated and hard to understand why people were acting like they were, but enjoyed the ending immensely. Charlee Russo agrees to present at a writers conference her friend Viv is hosting. But when she arrives to find that Viv’s daughter has been kidnapped, Charlee agrees to help run the conference before finally agreeing to help Viv figure out who has her daughter and why. With the hotel conference space double booked with a dog agility show, the firing of the chef who was supposed to cater the event, and zero instructions, the whole even seems to be going to the dogs. Charlee has to wonder if she Charlee Russo agrees to present at a writers conference her friend Viv is hosting. But when she arrives to find that Viv’s daughter has been kidnapped, Charlee agrees to help run the conference before finally agreeing to help Viv figure out who has her daughter and why. With the hotel conference space double booked with a dog agility show, the firing of the chef who was supposed to cater the event, and zero instructions, the whole even seems to be going to the dogs. Charlee has to wonder if she might not have been wise to just have turned around and hopped back on the plane home. But friends help friends and she wants to help Viv and her daughter. While Charlee keeps trying to get Viv to call the police, she cannot get her to move on this as the kidnappers clearly said not to call the police. When the kidnapers ask for ransom, they threaten to kill one conference attendee every hour that passes beyond the deadline. Charlee eventually calls the police herself and is threatened with a visit from the police when they tell her she has no evidence or proof of a kidnapping. But eventually Charlee has it figured out and she sets the trap for the kidnapper and finds the tables turned on her. Will the conference attendees notice she is missing and send help before it’s too late? This is one mystery that you’ll see you had all of the clues laid out, but just hadn’t made the connection earlier. I read the first book and wavered on the series, but wanted to see how the second book panned out and I am glad I idd. The writing is humorous and Charlee is just as hapless as the rest of us, making her relatable and the writing enjoyable. Looking forward to the next entry in the series. Charlee Russo, a mystery writer accused of murder herself not too long ago, is excited to join her long-time friend, Viv, at a writer's convention in Portland. Minutes after landing, all her plans are trashed when Viv blurts out that her daughter, Hanna, is missing. While Charlee agrees to take over the prep for the conference, she also decides to do a little investigating of her own. Although a bit snappish and irritated at times, Charlee is a likeable character. Her investigative skills ar Charlee Russo, a mystery writer accused of murder herself not too long ago, is excited to join her long-time friend, Viv, at a writer's convention in Portland. Minutes after landing, all her plans are trashed when Viv blurts out that her daughter, Hanna, is missing. While Charlee agrees to take over the prep for the conference, she also decides to do a little investigating of her own. Although a bit snappish and irritated at times, Charlee is a likeable character. Her investigative skills aren't always the best, but she's a writer, not a detective, so I can let that slide. She does have quite the imagination and her sense of humor often saves her from screaming. The addition of the double booking with a dog show added a lot of fun and colorful moments to the story. It was a great way to break up Charlee's worrying - about both the conference and the kidnapping - as well as lightening the mood with some humor. My one complaint is that the supporting characters weren't fully fleshed out so you're not sure of their true motives or possible involvement. Charlee, however, is well rounded and interesting and I'd happily read more in this series. Foul Play on Words is a fun and lighthearted cozy mystery. It makes for a quick read that left me smiling. There is one character, however, that I'm wondering about. I'm hoping that maybe he'll make an appearance in the next novel. Two chance encounters with him make me hopeful. Guess I'll have to pick up the next one and see. 3.5 stars. I love the main character, Charlee, in this series. She's got a great voice and gumption as she takes on the challenges in this book. But I'm not sure I believed that her "friend" would bail on her own conference when she knew that she had no reliable, experienced volunteers to help. Show up, but be distracted, yes. Dump stuff on Charlee and disappear? I don't know. While the circumstances were supposed to be stressful, I didn't get a good sense of these two characters as "friends" either. The number of fiascoes with this conference was almost unbelievable as well. The mystery in this is unusual, too, as Charlee wonders for a good portion of the story if a crime has even occurred. All of these factors made it difficult for me to just enjoy the story and get lost in it. It took some effort to push through. Charlee Russo is a mystery writer, who has agreed to speak at a Portland writers' conference to help her friend Viv. When Viv is late picking her up at the airport, that should have been her first clue something wasn't right. Despite it all, Charlee is compelled to investigate after she learns shocking secrets about both Hanna and Viv. Can she find Hanna in time, or will a plot twist lead her to a ruff ending? Not only is this book funny, it has a great mystery too! I found this book to be a fun, quick read, with a well developed plot and characters.. I recommend this book to all my cozy mystery loving friends. I enjoyed this book so much that I purchased the first book right away. Mystery author Charlee Russo agrees to be the keynote speaker at a Portland writers' conference organized by her friend Viv Lundquist. But things go wrong from the start when Viv picks her up at the airport. Viv's daughter Hanna has been kidnapped and she is frantic. Charlee agrees to take over the conference preparation so Viv can search for Hanna. Of course, all kinds of things go wrong at the hotel which has double-booked the writers' convention with a dog show, and Charlee is saddled with a Mystery author Charlee Russo agrees to be the keynote speaker at a Portland writers' conference organized by her friend Viv Lundquist. But things go wrong from the start when Viv picks her up at the airport. Viv's daughter Hanna has been kidnapped and she is frantic. Charlee agrees to take over the conference preparation so Viv can search for Hanna. Of course, all kinds of things go wrong at the hotel which has double-booked the writers' convention with a dog show, and Charlee is saddled with a group of hapless volunteers. Charlee also begins to doubt whether Hanna has really been kidnapped and wonders why Viv is reluctant to get the police involved. This was a decent read. I wasn't overly wowed by the plot or any of the characters. Some of the chapters were a little slow. One distraction was the missing letters from words in the text. It was probably a software issue because the cover picture was in four parts and very distorted. It will satisfy the mystery yearnings for most readers. Thanks to NetGalley for the advance read. Charlee Russo is coerced into helping her friend Viv with a writers conference. When she arrives, Viv announces that her daughter has been kidnapped and beside assisting with the conference, Charlee has to find Viv's daughter. A crazy set of circumstances ensues. I am glad I was not attending this conference, although the book was very funny. An amusing and confusing cozy mystery. Is there a kidnapping? Hotel double booked for two events? Some well-known names being used by unknown people. Adds to the humor. A fun romp with the dogs adding to the tale. Thanks to the publisher for providing a copy via NetGalley. I'm not sure why this book too me as long as it did to finish. The story was good and the mystery wasn't what I was thinking at first. I was a little confused by Charlee's reasoning. I look forward to the next book in this series! Charlee has agreed to speak at a writers' conference her friend Viv has organised. Unfortunately when she arrives, she discovers that Viv's daughter has been kidnapped and the conference is beset by disasters from all sides. This started full of humour and potential. Unfortunately the characters fell a little bit flat and felt a bit like caricatures in places (especially Brad Pitt and his womanising ways). It could have done with a little more development of the plot and relationships between cha Charlee has agreed to speak at a writers' conference her friend Viv has organised. Unfortunately when she arrives, she discovers that Viv's daughter has been kidnapped and the conference is beset by disasters from all sides. This started full of humour and potential. Unfortunately the characters fell a little bit flat and felt a bit like caricatures in places (especially Brad Pitt and his womanising ways). It could have done with a little more development of the plot and relationships between characters. My Review: Another great cozy mystery where anything that could go wrong does. This really reminds me of all the things that happened to me and my family a few years ago. I swear everything went horribly wrong and I thought there was no way we're going to come out of it alive. This one still had a solid plot and after finally reading book one I think that I had a better grasp on what was going on vs. what I thought when I hadn't. So I would say that although you don't technically have to read bo My Review: Another great cozy mystery where anything that could go wrong does. This really reminds me of all the things that happened to me and my family a few years ago. I swear everything went horribly wrong and I thought there was no way we're going to come out of it alive. This one still had a solid plot and after finally reading book one I think that I had a better grasp on what was going on vs. what I thought when I hadn't. So I would say that although you don't technically have to read book one it is better if you do. The characters were great and the mystery was wonderful. It has some great humor that wasn't over the top and a wonderful ending as well. I have really fallen for Charlee and her world and her books. I would love to see some kind of ghost written story that Charlee writes. I really can't wait for the next one! It was a pleasant and entertaining read even if it's a bit slow at times. I liked the humour, the characters and the plot. Many thanks to the publisher and Netgalley for this ARC. I voluntarily read and reviewed this book, all opinions are mine. The language is good, the characters are great, but the story and plot are more like a very bad comedy than a mystery. Becky Clark is the seventh of eight kids, which explains both her insatiable need for attention and her atrocious table manners. She likes to read funny books so it felt natural to write them too. She surrounds herself with quirky people and pets who end up as characters in her books. Her stout-hearted dog keeps her safe from menacing squirrels, leaves, and deer, but not plastic bags. Those things Becky Clark is the seventh of eight kids, which explains both her insatiable need for attention and her atrocious table manners. She likes to read funny books so it felt natural to write them too. She surrounds herself with quirky people and pets who end up as characters in her books. Her stout-hearted dog keeps her safe from menacing squirrels, leaves, and deer, but not plastic bags. Those things are terrifying. She is wiggly with anticipation over her upcoming release of FICTION CAN BE MURDER, the first in the Mystery Writer's Mystery series from Midnight Ink. Follow Becky Clark on Facebook at https://www.facebook.com/BeckyClarkAu... and at Amazon (https://www.amazon.com/author/beckyclark). If you enjoy her books, she’d swoon if you left a review. Yes, swoon.